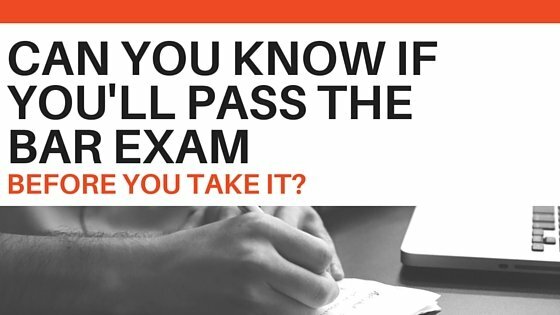 Can You Know if You’ll Pass the Bar Exam Before You Take It? According to 2014 statistics, you have a 74% chance of passing the bar exam the first time you take it, and repeat takers have a 35% chance of passing. However, these statistics don’t mean anything when it comes to your studying, so don’t give them another thought! Just keep reading. When it comes to preparing for the bar exam, no matter if you’re a first time-taker or repeater, it’s impossible to predict whether or not you will pass based on others people’s results. That’s why it’s much more effective to focus on where you stand in your studying and what you can do to ensure that you pass the bar exam, no matter how many times you have taken it before. This personalized approach to studying is also the focus of AdaptiBar’s MBE simulator and prep program, which targets your specific areas of weakness and caters to your individual study needs. Knowing this about AdaptiBar, is it possible to know whether or not you will pass the bar exam before taking it? Yes and no. AdaptiBar gives you an accurate prediction of how you will score on the MBE. This statement was proven in a study conducted by AdaptiBar, which revealed that how users performed in AdaptiBar accurately reflected how they performed on the MBE portion of the actual bar exam. How well do I know the law? You’ve been studying the law for years, but that doesn’t mean you’ve been learning it. Oftentimes students cram information into their short-term memory for law school exams, only to forget it shortly afterwards. In order to be successful on the bar exam, however, it is essential that you repeatedly review your outlines, have a regular study schedule, and make sure to fully understand a law concept before moving on to the next one. Doing this will ensure that the law is stored into your long-term memory. How am I managing my time? The bar exam isn’t only about the law. In fact, it’s just as much about managing your time. You are given 1.8 minutes to answer each question on the MBE, and a pre-specified number of minutes per essay depending on your state jurisdiction. How does your practice timing compare to these numbers? If you aren’t able to answer this question, chances are it’s time to start timing yourself or assessing your timing in AdaptiBar to get a better indication of your overall performance. Do I know my strengths and weaknesses? If you don’t know your strengths and weaknesses, it is impossible to know whether or not you are improving while you are studying or simply reviewing information that you already know. Ideally, you should be consistently studying your weakest subjects, without neglecting your strengths, and tracking your progress throughout. In order to identify your MBE strengths and weaknesses, simply log in to your AdaptiBar account and click on ‘Past Performance Table’ to check your progress in sets of 350 questions. Or, view the ‘Subject Performance’ tab to review your overall accuracy rates per subject and subtopic. Ultimately, these tools will assist you in identifying areas of weakness, which you can then study in your outlines before answering more practice questions. For step-by-step instructions on maximizing your use of AdaptiBar, see the AdaptiBar Preparation Method. Am I too focused on the number of practice questions I am answering? Simply put, quality is greater than quantity. If you are trying to answer as many questions as possible but not taking the time to understand why you got each question correct or incorrect, you are passively, not actively, studying. To avoid this, make sure that you fully understand the fact patterns and law concepts in each practice question or essay answer before moving forward. Ultimately, there is no magic bar exam score predictor. 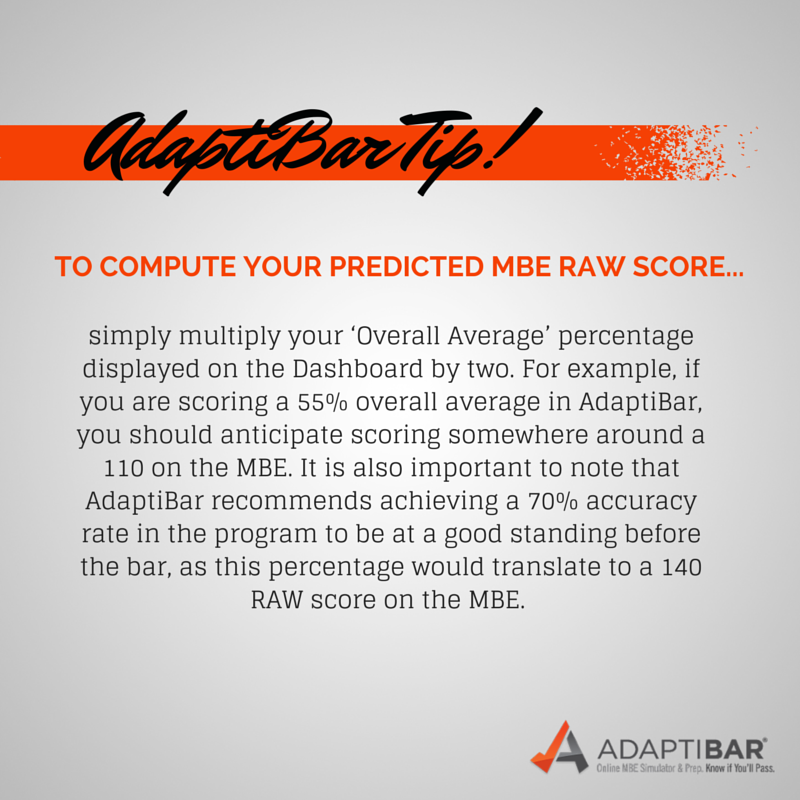 While AdaptiBar does come close with predicting your MBE score, it is still up to you to assess where you stand leading up to the bar exam to determine whether or not you are on track to pass. Announcing New Video Lecture Outlines! AdaptiBar Welcomes Our Newest Partner, CLEO!